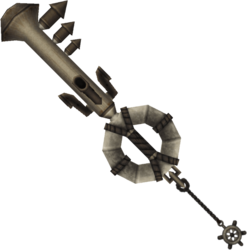 The Monochrome is a Keychain for Sora's Keyblade which appears in Kingdom Hearts Re:Chain of Memories and Kingdom Hearts II. 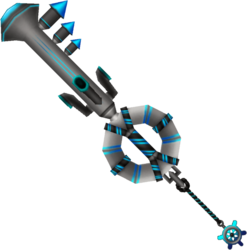 The Monochrome's guard is a lifesaver float while the blade is a steamboat stack. The Keychain is a ship's wheel, possibly that of the Steamboat Willie. The teeth also resemble the steam whistles from Steamboat Willie. Other than that, the Monochrome resembles the transmitter of the Graham Bell phone. "Monochrome" refers to images executed in shades of a single color, and is often used to describe things that are in black and white, like the world of Timeless River.